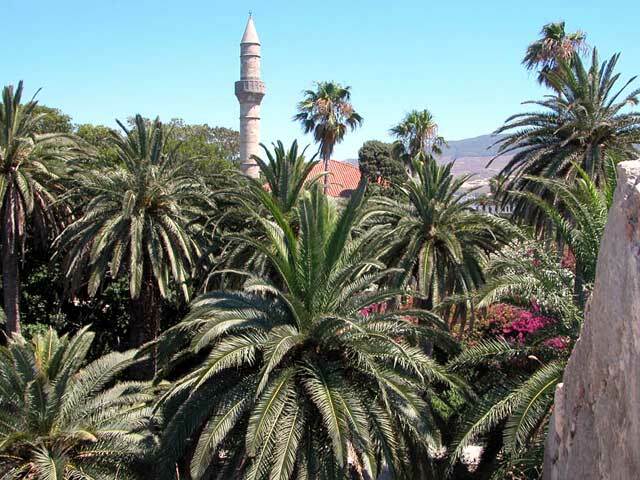 This is a view on the very center of Kos city hidden under the palm trees with dominating minaret, you can see also a roof of historical mosque next to it. How is it possible after ages of wars and mutual hatred, including religious intolerance, after still unresolved and painful Cyprus crisis of sixties, close to the Turkish coast (4 km of sea distance) in the center of the Greek city of Kos to see dominating a mosque of Hassan Pasha? Very easy: life is much more simple and normal on the "grassroots" level, relationships among the people are much better and more tolerant, than one could imagine when reading newspapers or listening to politicians. Picture was taken from one of the bastions of the town citadel, the castle of the Knights of St. John from 14-early 16 century.